ZOLL® Medical Corporation has partnered with militaries worldwide for over 30 years, with an emphasis on advancing resuscitation and acute critical care technology. ZOLL’s traditional products have focused on defibrillation and monitoring, circulation and CPR feedback, data management, fluid resuscitation, and temperature management. 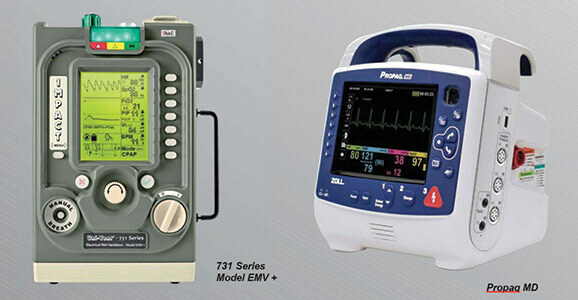 In October 2014, ZOLL acquired Impact Instrumentation’s line of respiratory care products. Impact Instrumentation has been designing and manufacturing portable and automatic emergency ventilators, portable aspirators, custom mounting systems, and specialized testing systems for over 35 years. Products include the Uni-vent® Series of portable critical care ventilators, and the Ultra-lite® Series of portable aspirators, which are used aboard ships, aircraft, and other military medical and transport services. These products complement ZOLL’s comprehensive portfolio of innovative lifesaving equipment for military applications worldwide. Impact ventilators have been the standard in military environments for over 30 years. The latest addition to the ventilation portfolio is the 731 Series Model EMV+. This ventilator lever-ages the technology the military has come to expect from the Impact 754 Eagle™, while providing a portable ventilator that is rich in features, small in size, durable, and intuitive to use. With its multiple modes of operation (AC, SIMV, CPAP and BiPAP), it can support patients, infants through adults, presenting with significant respiratory pathology. The Impact 731 Series Ventilator and Ultra-lite® Model 326 Aspirator, both the standard of care within the military, now join the Propaq, the standard in military monitoring and defibrillation. ZOLL’s Propaq® MD Monitor/ Defibrillator and the Propaq M Monitor, are the next generation versions of the Propaq Encore 206 Monitor, with more advanced monitoring parameters and robust data communications. With over 12,000 Propaq monitors in use throughout the U.S. and NATO militaries, Propaq is the trusted and proven standard of care vital signs monitor. The Propaq MD/M was developed specifically to meet the unique needs of the military worldwide. Development of this product line was a joint undertaking between the Department of Defense and a cooperative arrangement between Welch Allyn and ZOLL. ZOLL’s Propaq MD/M provides everything the military expects from a Propaq, trusted and proven technology, but now available with more features. The Propaq MD/M both come with 12-lead capability with interpretation, two continuous temperatures, motion-tolerant NIBP, and more importantly, three invasive pressures. For those who have always desired a Propaq with defibrillation, an optional defibrillator and pacer are available on the Propaq MD. No longer is there a need to deploy with a vital signs monitor, defibrillator, and an ICP monitor. The Propaq MD provides all this capability and more in a single device. The Propaq MD/M operates continuously with a long battery life (over 7.5 hrs. with the Propaq M), and its “hot swappable” battery design is unique to the ZOLL Propaqs. ZOLL has incorporated the latest Masimo rainbow® SET technology into the Propaq M and Propaq MD. Total haemoglobin (SpHb), arterial oxygen content (SpOC) and pleth variability index (PVI) are the latest clinical parameters that have been added to the Propaq. ZOLL also entered into a development agreement with Reflectance Medical Inc. to incorporate a ruggedized version of the Mobile CareGuide™ sensor into the Propaq. The CareGuide provides clinicians with the ability to non-invasively measure SmO2 for early identification of haemorrhagia and efficacy of resuscitation and noninvasive pHm for efficacy of resuscitation to reverse acidosis or as a possible adjunct to assessing septic shock. Minimizing size, weight and cube is critical for the military. The new Propaqs are no exception. The Propaq MD is 60 percent smaller and 40 percent lighter than other similar monitor/ defibrillators. Propaq is synonymous with ruggedness. De-signed for the austere environment, both the Propaq MD and M have an IP55 rating, which is the industry’s highest ingress protection against water and dust. The extra-large multifunction display with a normal, daylight, and NVG settings, allows optimal viewing regardless of the operating environment. Additionally, the Propaq MD offers a robust data management capability integrated into the most fully featured monitor/ defibrillation on the market today. Communication of critical vital signs data is essential to improving patient outcomes. Even more important is the quality of the vital signs data being transmitted. The Propaq MD/M addresses both of these needs. The Propaq, for the first time, has an open data architecture, ideal for the communication needs of the military. Data is easily transmitted from the device using either a wired or wireless connection. By partnering with key data integration companies, ZOLL can offer the ideal telemedicine solution needed in today’s theatre of operation. Data from the ZOLL Propaq MD/M can remain with the patient or the data can be transmitted to the receiving facility prior to the arrival of the wounded warrior. It is ZOLL’s goal to help facilitate the transfer of the complete medical record flowing into the military’s EMR system. With the increasing desire to adopt telemedicine into the military environment, a new feature has been developed for the Propaq line of monitors and defibrillators. Each Propaq has the ability to be remotely viewed. Advancements in the dedicated communication processor within each Propaq now allows for streaming of both vital signs and waveform data. Information from up to 40 individual Propaqs can be viewed at a single remote location. Customized patient reports generated on the individual Propaq, can be requested remotely. This capability is ideally suited in casualty evacuations / air transports, disaster medicine or any military scenario where monitoring multiple patients at the same time is required. ZOLL continues to evaluate technologies to support the needs of the military and improve combat casualty care. In January 2015, ZOLL acquired Advanced Circulatory Systems, Inc., which develops technologies to non-invasively increase circulation. These innovative technologies use the body’s own mechanisms to treat hypertension and shock without the use of pharmaceutical or other agents. This non-invasive therapy can potentially protect the heart, brain, and other vital organs when blood flow is compromised. ZOLL continues to focus on delivering mission-ready technology that provides clinically accurate and reliable information for optimizing combat casualty care on the battlefield. ZOLL consistently delivers technologically advanced products driven by customer requirements without compromising our commitment and focus on improving clinical outcomes. As a global company and leading military supplier, ZOLL is proud to pro-vide innovative and reliable products that help improve health care from point of injury to definitive care for military service members.